Q: What are some of the other Home Server Controls that I can take advantage of in my add-in? A: Three of the most commonly used controls are QButton, ConsoleToolBar and LineBox which individually behave virtually identical to existing controls, only draw themselves in a more Home Server-ish style. Despite these and other differences, the QButton is still a fantastic way to easily get a little more Home Server-ish styling in ones add-in. Note: you are free to add any other object that inherits from ToolStripItem, ConsoleToolBarButton is the only control that maintains the theme. One possible issue that may arise using the above method is the text color not reverting if the button is disabled after the MouseEnter event, something that will keep a MouseLeave event from ever being fired. Instead it is good to be aware of this edge case and manually change the color when disabling the button. All throughout the Microsoft settings pages we see a style not often seen since Visual Basic 6 applications we all the rage: colored horizontal lines. Problems can quickly be had if one attempts to change the size in the designer (ie without using the Properties window) where the line can get very large and unwieldy. Furthermore, when the line is only a pixel tall it is almost impossible to click on to select and then move around on the form. 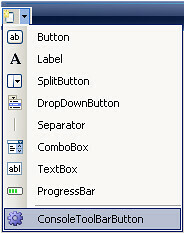 Unfortunately LineBox is another one of those controls written without the designer in mind, something we see when we find we are unable to change the header text in the designer. QButton, ConsoleToolBar and LineBox are three semi-new controls that provide a fantastic way for a Home Server add-in developer to get the same functionality they are used to with existing controls, but with the benefit of staying with the Windows Home Server style of design. Next week we'll discuss the MessageListBox control, the very control that is used to display messages in the Home Network Health dialog and messages and the available and installed Add-ins. Tomorrow though as a special Christmas gift, a little tip that made me giggle like a little girl when I learned it. i've been looking everywhere for this information...thanks for posting it....but...any idea how to get the standard WHS DataGridView that all the plugins are using? also your C# based project doesn't complile until you add all the references manually....might want ot change that. never mind...i'm retarded...just saw posting #11. cheers!